Forney native and 2018 North Forney High School graduate is serving in the U.S. Navy aboard USS Portland, one of the Navy’s newest and most advanced amphibious ships. 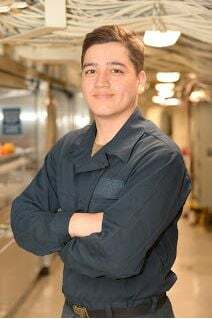 Seaman Kevin Batres is serving aboard the amphibious transport dock operating out of San Diego. A Navy seaman is responsible for maintenance and preservation of the ship. Batres credits success in the Navy to many of the lessons learned in Forney. Being stationed in San Diego, the principal homeport of the Pacific Fleet, means Batres is playing an important part in America’s focus on rebuilding military readiness, strengthening alliances and reforming business practices in support of the National Defense Strategy. As a member of one of the U.S. Navy’s most relied-upon assets, Batres and other Portland sailors know they are part of a legacy that will last beyond their lifetimes providing the Navy the nations needs.